Last year, the Law Center received approximately 916 applications for the J.D./C.L. program for an enrolled class of 179*. The first-year class in Fall 2017 includes graduates from 68 colleges and universities throughout the nation. Men make up 54% of the class, 46% are women. The median LSAT of entering students is 154; average GPA is 3.44. 71% of the class is non-minorities, 27% minorities, and 2% did not indicate. LSU Law’s unique focus on the civil and common law systems means attorneys trained in the program can and do come from anywhere—and practice successfully in any venue. 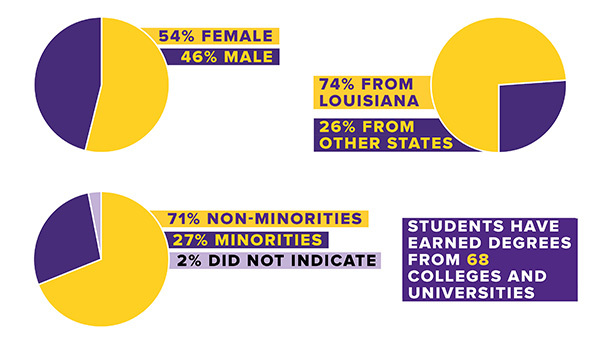 LSU law students are active in campus life, the community, and academic associations. The Law Center sponsors and encourages student participation in national trial and appellate competitions throughout the school year, with outstanding success. Student accomplishments are a result of the emphasis placed on training in litigation, practice, and procedure. LSU graduates excel in their performance on bar examinations, whether in Louisiana or in other states. One of the most important reasons LSU students have attained such a high level of competence and success is the work ethic fostered by the school’s demand for educational excellence. The process begins with the extremely high standards set by faculty for the quality of legal work in the classroom. Students meet these high standards, are challenged by the quality and quantity of work demanded, and are introduced at an early stage to the pressures characteristic of the practice of law.